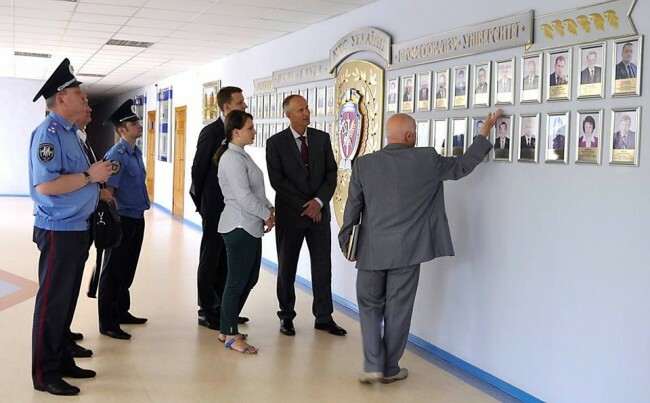 A European Union Advisory Mission (EUAM Ukraine) Regional Outreach Team visited Kharkiv for the fifth time in July. They discussed with the Ukrainian partners mainly practical issues and specifically asked them to describe the challenges of the reform process in the Kharkiv Region. The interlocutors provided detailed insights into these processes, which will enable the EUAM experts in due time to provide them with tailor-made advice. During the visit EUAM delegation met amongst others the Head of the Regional Council, the Head of Public Order of the Ministry of Internal Affairs in Kharkiv, the Director of the National University of MoIA (KhNUIA), the Deputy Head of OSCE SMM Kharkiv, as well as representatives from the UNHCR and main Non-governmental Organisations (NGOs). The EUAM delegation was composed of Stanislav Bezovsky, Pekka Hyytiainen, Ganna Striletska – they were accompanied bv Ondrej Vosatka from the EUAMs Coordination and Cooperation Component.